I think I’ve become known as a person interested in nonfiction writing just as much as fiction in the furry fandom. I publish things whenever I can at [adjective][species] (a team I’ve had so much pleasure working with), and I have a piece coming up about analyzing some of the sociological aspects of post-con depression. But my biggest project, which I have been working on for well over a year now, is my novel The Bad in the Briar, which is about a fox with psychic powers who lives in an insular mountain community with a family who doesn’t have electricity. It’s a coming of age story with a splash of horror and adult content. I wanted to write a fantasy that felt very human and very earnest despite taking on an epic fantasy model. This might be a story about somebody from your home town who dropped off of the face of the earth as opposed to a crown prince discovering their heritage. The best metaphor I have for my process is something akin to clay relief sculpting. You have a planning stage where you draw out a rough idea of what you want your sculpture to look like. You add large chunks of clay to the piece, which look ugly and gormless as first, but once the big chunk is on the slate, you go through a subtractive process to redefine elements of your sculpture. You carve in small details and remove a lot of the raw product to make a beautiful piece, and then you add more rough shapes into the artwork to slowly shape it, repeating your process. So for writing, I’ll do a very non-detailed skeleton outline. It will be simple and sparse but it will have a clear beginning, middle and end. I’ll leave myself a lot of wiggle room for the in-betweens to grow organically, but knowing what is going to happen with big decisions in the plot helps me ahead of time. It also allows me to work on something like the end before I write the beginning, or vice versa. Sometimes your finished product is going to veer away from your original plan, but that’s the nature of art, and sometimes it works out for the better. Keeping a plan very simple is helpful for me, because I know that as you write and continue to add prose, you’ll introduce complications of your own, and the story will develop like a weed that’s getting out of control. You don’t have to add more complications to the planning stage. A lot of the pieces I tend to work on draw inspiration from living around poverty for most of my life. I like thinking about the places in America (and not just America) that often don’t get their stories told. Really bizarre, niche things like the inexplicable phenomenon that is roadside dinosaurs, or towns in the deep South that still exist to this day which only have one federal building in their town–that building being the post office. We have places in America like the Biltmore Estate in Asheville, North Carolina which is this grand, majestic castle showing off the wealth and opulence of the Vanderbilts that exists within driving distance of some of the most ridiculous tourist traps you’ve ever seen; things like gemstone mines with egregious pictures of cartoon prospectors where tiny children pan for uncut gems and go wild about owning a “real-life” emerald. That kind of juxtaposition is amazing to me. I also feel like for a community that spends so much of its time talking to long distance friends over the internet, surprisingly few stories incorporate aspects of online life. Little things like sending a text or showing off a character’s typing habits, or one person’s tendency to make typos versus another person. I try to incorporate how social dynamics have evolved a bit when it comes to things like instant messengers, texts and twitter. Something that’s interesting to me is also how I feel like I’ve become this inadvertent liaison between writers who write and love erotica and writers who strictly write for a general audience. I write both of these things, and I care a heck of a lot about both. Furry is an interesting space that I think desperately needs stuff like smutty gay fiction as well as something you may read and say “oh hey, I can easily see this getting The John Newbery Medal.” All I can say is that art comes in many different forms, and I have high standards for all of it, no matter the content or the purpose of the writing. I think a lot of things that have irked me about adventure or fantasy novels is that the main character is stressed as an “every man.” They’re supposed to be our windows into fantastic worlds and they aren’t supposed to have the strongest personalities because it’s believed that these types of characters can be easier to relate to. That’s always bothered me, so I wanted to spend extra time on making sure I really liked the protagonist of The Bad in the Briar, Keene. He’s this quiet, observant guy with decent intentions. He hasn’t been dealt the best cards in life, but he copes with them in the best ways that he can, and I try to make those coping mechanisms fun. On one hand, memoirs and fiction that read like memoirs. I Capture the Castle by Dodie Smith is about this girl who lives with her weirdo family in this castle that’s falling apart and how they deal with the eccentricities of their home and one another. Into the Wild, which is a nonfiction story written by John Krakaur, really helped me think about how to write an adventure story about a real person who breathed and died in the unforgiving Alaskan wilds. On the fiction side of things, I’m a huge fan of alternate history. The Man in the High Castle and Kindred come to mind immediately. Those are both examples of works with highly speculative concepts such as time travel and alternate dimensions but focus so much on the characters and a grounded society that you can sometimes forget you’re reading a fantasy. I read too many books that I love, but God of Clay by Ryan Campbell and Song of the Summer King by Jess E. Owen are two very different and very accomplished examples of a great read. I’m an avid baker. I make my own breads and cakes and spend more than a few nights enjoying shows like the Great British Bake-off and Cutthroat Kitchen. Amateur gardening, video games and table top games have their place in my de-stressing rituals, too. I also like to hike and explore my town, looking for strange things that might give me a little bit of writing inspiration. Write what you love. There’s always going to be an audience for everything. Don’t get bummed out when somebody doesn’t like a thing that you write, because what makes readers and the world of writing great is just how diverse everybody’s tastes are. You can write a masterpiece and somebody will be guaranteed to still hate it (which is a real issues even for big deal authors and New York Times bestsellers). Just always be mindful that your writing can always improve, and for all serious writers, improving is a life-long journey that does not end. Well, at least not until that pesky mortality comes along. I’m all over the place. You can find two of my adult stories in the anthologies Will of the Alpha 2 and Dungeon Grind. I’ve published poetry in the Weasel Press anthology Civilized Beasts and the online journal [adjective][species], where I also publish essays and nonfiction pieces. 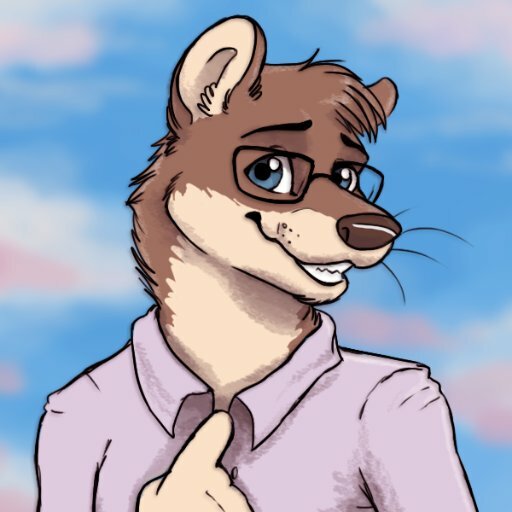 My favorite thing about the furry fandom is that I can tweet a long, rambly stream of thought about why I think a weasel makes sense for me as a representative species and strangers will look at it and go “hey, that makes sense,” which is equally cool and also bananas. Check out George Squares’ member bio here! This entry was posted in Uncategorized and tagged george squares, member spotlight. Bookmark the permalink.